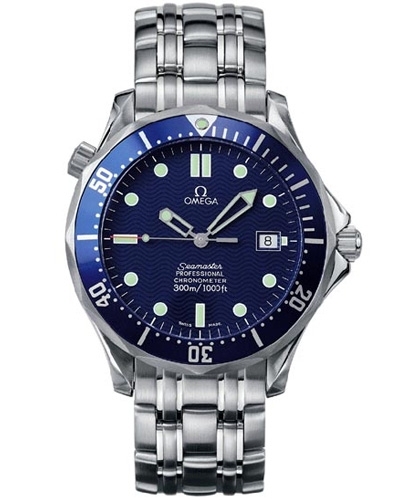 A handy new feature of 007’s Omega wrist watch is a night light that appears to have the power of a thousand candles, as it illuminates the protective Zorb bubble from which his jacket has ejaculated. We later learn that it also has an impressively high tensile strength grappling wire. 007 gets to press the button, fire the piton and, I can’t emphasise this enough, the strength of the wire and the power of the watch mechanism is enough to lift James Bond around thirty feet at around 10mph. No, that length of wire, with that strength, with pulling capacity that fast, is not and never will be possible. James Bond had moved away from Rolex (Ian Fleming's brand of choice for his character), in Goldeneye, in favour of the Omega Seamaster Professional Diver, which would be worn by Pierce Brosnan in all of his James Bond movies. The model used in The World Is Not Enough is a Professional 2531.80.00 Chronometer, stainless steel full sized with blue face, blue bezel with a stainless steel bracelet.